The world's first major astronomical observatory had no telescope. Although it featured some of the best and most accurate instruments ever built, they simply made it easier to do what astronomers had been doing for centuries: map the night sky by plotting the positions of the stars and planets. 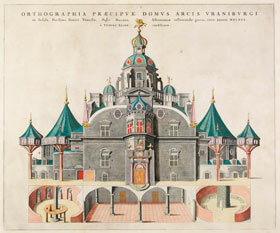 The observatory, known as Uraniborg ("Castle of the Heavens"), was built by Danish astronomer Tycho Brahe, one of the most gifted skywatchers in history. He designed and built more than a dozen major instruments for Uraniborg and a second observatory, Stjerneborg ("Castle of the Stars"), next door. The instruments included sextants (though without any glass optics), quadrants, armillary spheres, and others. All were tools for plotting the positions of astronomical objects. Some measured an object's altitude above the horizon or its direction in the sky, while others measured angles between two target objects. With these instruments, Tycho produced the most accurate and detailed star atlases to date. He also precisely plotted the positions of planets as they moved back and forth across the sky. Johannes Kepler later used these catalogs to devise the laws that explain how planets move around the Sun, confirming the view that Earth is not the center of the universe. Yet Tycho's instruments were basically finely crafted extensions of the human eye. They could see no deeper into space and no more clearly than the eye alone. Thus, their ability to improve human understanding of the universe were limited. That ability improved dramatically in the 17th century with the invention of what is still the mainstay of astronomical research: the telescope. Using these assemblages of metal tubes and glass lenses, some of the giants of modern science revolutionized our knowledge of the universe around us and our place in it. And they set the stage for more dramatic discoveries in the centuries ahead. Key dates and inventions in the quest to see deeper into the universe. Hans Lippershey invents a ‘looker,’ the first confirmed telescope, by aligning two lenses inside a metal tube. Legend says that sometime in 1608, two children entered the shop of Hans Lippershey, a German-born eyeglass maker who was working in Middelburg, the capital of Zeeland in the Netherlands. The children picked up two lenses and held one in front of the other, producing a magnified image of the weathervane atop a nearby church. Lippershey was astounded. He encased two lenses in a small lead tube, and offered his new “looker” to the government. Today we know the device as the telescope. Regardless of whether the legend is true, most historians consider Lippershey the creator of the telescope. Although others may have experimented with combining lenses earlier, the first written record of any telescope is Lippershey’s patent application. He applied for a patent for “a certain instrument for seeing far” before the States General of the Hague in October 2, 1608. Within days, two other opticians filed similar applications: Jacob Metius of Holland, who claimed that he had been working on his device for two years, and Sacharias Janssen of Middelburg, who some say had invented his looking glass even earlier. The States General felt that the invention couldn’t be kept a secret, so it denied the applications. Even so, Lippershey still managed to turn a profit on his invention by selling several spyglasses to the government. Lippershey’s “looker” was a refracting telescope, which uses lenses to gather and focus light. In the original design, the lens at the front of the telescope was curved outward at both front and back, while the lens at the eyepiece was curved inward. The first lens “bent” parallel light rays, bringing them together at a specific point behind the lens. The second lens magnified the view. Working together, the lenses made distant objects look larger and closer. Using a telescope of his own construction, Galileo Galilei studies planets, the Moon, the Milky Way, and other astronomical objects, igniting a scientific revolution. In 1611, Johannes Kepler conceived of a new way to build a refracting telescope. He suggested using two convex lenses (which curve outward on both front and back) instead of a convex and a concave (which curves inward). This design provided clearer, brighter views, although the image of the object was inverted. The design was adopted a couple of decades later, and remains the preferred model for most refractors. By early 1609, the telescope was a “must-have” item for the rich and the educated across western Europe. France’s ambassador to the Netherlands presented one to the French king, and telescopes of up to about three-power magnification were sold in Paris, Venice, and other centers of commerce and learning. Galileo Galilei, a mathematics professor at the University of Padua, near Venice, heard rumors of the remarkable new spyglass, which supposedly made distant objects look larger and closer. When the rumors were confirmed, Galileo built such a device himself, and earned a lifetime appointment and a fat salary by demonstrating it to local leaders. Galileo earned his reputation as one of the giants of scientific thought, though, by turning his first crude telescopes toward the sky. 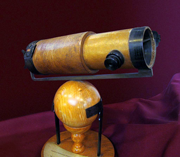 Galileo used the same basic refractor design as Lippershey, initially providing about a three-power magnification. With refinements, he eventually bumped that up to about 30 power. Even so, Galileo’s telescopes opened new realms in the heavens. When Galileo looked at the Moon, for example, he saw a rugged surface marred by mountains, an amazing number of impact craters, and other features. And as the Moon changed phases, and the dividing light between night and day swept across the landscape, he could see the shadows of the mountains and craters. In the hazy, glowing band of the Milky Way, Galileo saw thousands of individual stars. And he saw clusters of dozens of stars scattered across the sky. Perhaps his most remarkable discoveries came when he viewed the other planets, which look to the unaided eye like bright stars. Galileo saw four tiny “stars” arrayed near the bright planet Jupiter, for example. As he watched them night after night, they remained near Jupiter but changed configuration. Galileo decided that they must be moons of Jupiter, so they orbited the planet just as the Moon orbits Earth. And when he watched Venus, he saw that it went through a series of phases, just as the Moon does. At the time, the leading model of the solar system placed Earth at the center, with the Sun, Moon, and planets all orbiting our planet. Venus was thought to circle between Earth and the Sun. Galileo’s discovery, however, showed that Venus must circle the Sun instead of Earth. As with a crescent Moon, when Venus forms a crescent the planet is roughly between Earth and the Sun, so only a sliver of the daylight side faces our way. And a nearly full Venus must align "behind" the Sun as seen from Earth, allowing us to see almost the entire sunlit side. Galileo’s observations challenged the belief that the cosmos were perfect and unchanging, with Earth at the center of the universe and everything else circling around it. The Catholic Church charged him with heresy, and to save his own life he was forced to recant. He spent his final years under house arrest. Yet Galileo had unleashed a scientific revolution. With Galileo’s observations to back it up, the world soon accepted a new model of the solar system, proposed by Nicolaus Copernicus, which held that Earth and the other planets orbited the Sun. The revolution that Galileo began continues today, as astronomers use the telescope to probe the farthest reaches of time and space. Seeing and Believing: How the Telescope Opened Our Eyes and Minds to the Heavens, by Richard Panek (New York: Viking, 1998). Isaac Newton reveals a new type of telescope, which uses polished mirrors instead of glass lenses. While Newton’s reflecting telescope overcame the rainbow-like haloes around astronomical objects, it left the view somewhat distorted because of the mirror’s spherical curvature. Eventually, astronomers would adopt designs using mirrors with parabolic mirrors instead of spherical ones. (If you extend the curve of a parabolic surface into space it remains open, with the ends never joining.) James Gregory proposed this design in 1663, but there was no way to create parabolic mirrors at the time, so the design was not implemented for decades. Grinding glass to the right shape for refracting telescope lenses was a daunting task, and Galileo’s telescopes produced a slightly blurry view of the sky, with colored “haloes” around astronomical objects. And the glass contained chemical impurities that colored the lenses green. Isaac Newton, who is best known for devising his laws of motion and gravity, realized that part of the problem was with the glass itself. Any glass lens acts like a prism, splitting a beam of light into its individual wavelengths or colors, so there was no way to eliminate the colored haloes with lens-based telescopes. So Newton devised a new type of telescope, which he presented to his colleagues in England’s Royal Society in January 1672. Instead of glass lenses, Newton’s telescope used two polished metal mirrors. The primary mirror, at the bottom of the telescope tube, curved inward slightly, in a spherical shape. (In other words, if you extend the curve of the mirror into space, it will form a sphere.) Light from an astronomical object struck this mirror and reflected back up the telescope tube, where it hit a flat secondary mirror. This mirror, which was tilted at a 45-degree angle, in turn reflected the light to an eyepiece at the side of the tube, where the observer saw an image of the star, planet, or other astronomical object. Although it took a while to work out some problems and gain acceptance by most astronomers, Newton’s creation of the reflecting telescope ushered in a new era of astronomical study. By the early 18th century, most astronomers were using reflectors, and although refractors made a brief comeback a century later, all large modern-day research telescopes are reflectors, and Newtonian-style reflectors are popular among amateur astronomers. Copyright ©2009-2012 McDonald Observatory. This material is based upon work supported by the National Aeronautics and Space Administration under Grant/Contract/Agreement No. HST EO 11210.08 issued through the Space Telescope Science Institute, which is operated by the Association of Universities for Research in Astronomy, Inc., under NASA contract NAS5-26555.